With your art business, it is essential you network with other people in order to make useful contacts. You can do this at home, organisations, business functions, or even on-line using your computer. These are places where people meet and post questions and problems they may encounter within certain boundaries. You need to make sure that you join forums that deal with your type of business, such as an art forum or a business forum. Once you have joined, which is normally free, you will be able to mix with like-minded people about all things business and even make some valuable contacts on the forum. Some business organisation websites have forums that you can join, so check them out. There are a few social networking sites, but the main ones are MySpace and Facebook. These are a fantastic way of reaching other people across the globe as well as locally. They are free to join and open up a whole new way of presenting your work to people. You can upload photos, send out invitations, message people privately, join groups that deal with the topics you're interested in and you can chat in real-time via your page. The good news is with Facebook that you can also access it on your mobile or Blackberry device, making it truly accessible whenever you need advice. Networking is an important part of running a business as it gives you access to people who have been where you are, or who are going through it with you. They can offer advice, possibly invest in your business or give you the details of someone who can help or supply the items you need. Although it may seem scary approaching people you don't know and talking to them about your art business, remember that they have been where you are now. Networking is easy once you have built up your confidence and tried it. If nothing else, you will make some really good friends in the business world and that in itself is invaluable. Join a few forums and networking sites before plucking up the courage to attend formal business dinners or events, that way you will already have learned the basics of how to talk to other business people. Remember, if you believe in your product or creations, other's will too as your enthusiasm will be infectious. Confidence attracts other people, but shyness won't. 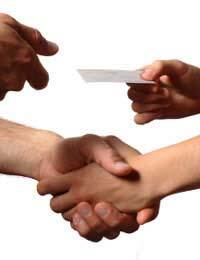 When you attend events, have your business cards handy and give them out at every opportunity. Make sure they look professional and have all your contact details on them; you never know when someone will get back to you following an event.